Build the perfect scene for your next adventure with the city of the Dead statues & monuments set! 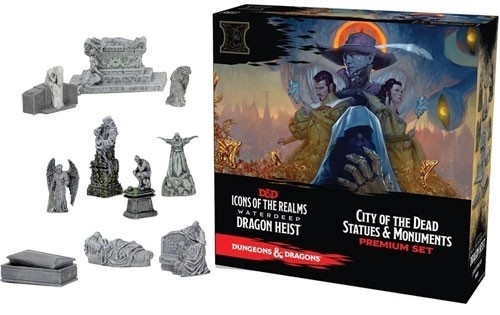 WizKids, the industry leader in quality pre-painted plastic miniatures, presents its newest Dungeons & dragons set, city of the Dead! This gorgeous Set of miniatures includes several beautifully carved statues & monuments as well as several coffins that can be used in a variety of locations! this fantastic pre-painted Set contains a variety of pieces to create an immersive roleplaying game experience. The perfect setting for your Water deep Dragon heist adventure and a beautiful display Set as well!